Wild Children available for pre-order! I'm very excited to announce that my upcoming novel, Wild Children, is now available for pre-order in print (US only) and on Kindle. Official release date is set for April 28-th. I hope the book is well-received and enjoyed by the readers. It has been quite a journey with this book. I was pregnant with my son when I began writing it, and this little boy is now two years old. I can now also reveal that I already completed the first rough draft of the sequel and began outlining and writing the third book, so there's plenty to look forward to. So here's to the successful debut of Wild Children in exactly a month! Chuck Wendig, in his new and excellent post, recommends professional authors to have their own space. Now, without getting into who exactly can be considered a professional author and whether I qualify as one, I can definitely say I might be the poster girl for the Disadvantaged Writers International Forum, working with zero private space, zero budget, and a miserly allowance of time. I'm not saying this to complain, but rather to demonstrate that if I, under my conditions, can produce a respectable amount of work, anyone can if they want to badly enough. I don't have my own office, work desk or even computer. I live in a rural area where I often have no Internet signal or, to be honest, even power. Yes, I might be in the middle of an important email and not be able to send it, or I might just be finishing a chapter and it all goes into oblivion as the computer gets turned off (because our old laptop has no battery life, it must be plugged in at all times). I do save obsessively, but still sometimes I lose work. I have three kids and homeschool, which means that any serious writing gets done when everyone is asleep. Furthermore, no one else in the house acknowledges the need for actual uninterrupted writing time. My family knows I write, and they think that's cool, but they have this notion that books write themselves and if I'm home around the clock, I'm not entitled to have a minute to... no, not to myself, because that would be a ridiculous demand, but to do something that might potentially contribute to feeding and clothing everyone under this roof. If you could see me some days, you'd pity me, desperately trying to put in 500 words in 10 minutes, refusing to lose the battle and admit no writing will get done today. And yet I'm making progress. I have a book coming out next month, another making rounds of agents, yet another project currently circulating among beta-readers, and a WIP novel I have planned to be 100K words, out of which I have written 40K so far. It's like walking uphill while pushing a heavy barrel in front of me. I wish I could ditch the barrel, and I do sometimes feel handicapped because of it, but I don't give up. I keep walking. So can you. Even down a muddy road. Even in shoes that pinch. Even if nobody knows why you bother walking down that road at all. You just keep going, no matter what, until you get there. I don't know about you, but I, as an indie author working on practically zero budget, find it very challenging to get reviews. Many book review blogs and sites are effectively closed to indies, and I can't afford to shell out 425$ (or whatever it is) for a Kirkus review. Furthermore, I don't push my books, engage in review swaps or do other things which reek of aggressive and dishonest self promotion. I publish, offer review copies, network and rejoice when someone likes my book enough to review and recommend it to others. As simple as that. You can imagine, then, what I must have felt upon discovering that Amazon removed a couple of lovely, helpful, legitimate and genuine reviews from one of my books. My inquiries led to no actual response except pointing me to the review policy page. A bit of further digging revealed what the matter probably is: the reviewers are my Facebook friends. Now, the number of my Facebook contacts is pushing a thousand, and most of those are people I know very slightly, even online. My Facebook is a professional network, not a place to hang out with high-school friends. The reviews came from people who bought the book, liked it and spontaneously reviewed. I didn't even send out a review copy. But I guess Amazon doesn't care. They are tightening their review policy to avoid fraud and don't mind losing a few dollars in royalties because some indie authors have fewer reviews. Amazon can afford that. Authors backed by big publishers and large budgets probably can, too. Indie authors can't. The truth is, I have heard warnings from several people telling that Amazon is becoming less friendly to indie authors, being essentially a monopoly with no competition to speak of, but until now I chose to ignore this warning, as KDP has been so convenient. Publishing is quick and easy, and I don't have to mess with multiple retailers for my digital books. Convenience apparently comes with a price, though - that of being at Amazon's mercy. 1. Start buying books from other places, even though a mega site like Amazon where everything can be found is mighty convenient. 2. If a book looks good (cover, blurb, etc) but has no reviews, take a chance on it. Consider that the reviews might have been arbitrarily removed by Amazon. 3. Encourage, promote and participate in other venues of book exposure: Goodreads (though it has been purchased by Amazon as well), social media and author blogs. Be generous with recommending books you have read and enjoyed. Some people told me I put too much stock in reviews. But I can tell that for me, as a customer, an intelligently written, genuine-sounding review is the number one purchase inducer. It's basically an equivalent of the good old-fashioned word of mouth, which remains the most effective way of book promotion I know. 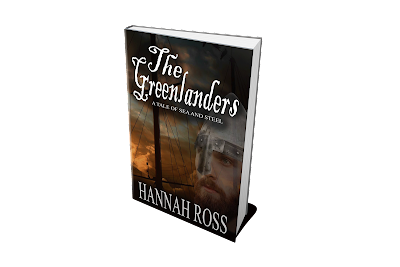 "The heroes of The Greenlanders are the legendary explorers Erik the Red, Leif Erikson, and other characters from Saga of Erik the Red and Saga of the Greenlanders. However, as the sagas are not historical documents, I had a lot of leeway with my interpretation of them. So would you say that people are fundamentally the same now as they were a thousand years ago? Or has something vital changed (besides the technology)? What makes the average Joe or Jane from the 11th century different than the 21st? I believe, and this also ties in with the previous question, that human beings are all pretty much the same anytime and anywhere. We are infinitely better educated and have a lot more options than a thousand years ago, but ultimately the things that make us tick are just the same." Diversity in literature: important trend or artificial move? Lately I have been privy to a lot of talk about diversity in literature; the pivotal point being that the main protagonists, especially in fantasy and/or sci-fi, shouldn't be so predominantly male, white and straight. Is diversity a good thing? To be sure; but, and this is an important but, only when it happens organically. What do I mean? In Paths of the Shadow, I have a character who is gay (or rather, bisexual who considers himself gay). Right now I am working on a novel in which the MC is a colored man. Was it done to promote the agenda of diversity? No; those characters simply appeared in my mind, took on a life of their own, and demanded to be written. I'm against the introduction of diversity along the lines of, "Well, I'm going to sit down and write a sci-fi novel. Let's make the main character, Zoe, black with some Native American lineage thrown in for good measure. Zoe is also lesbian, overweight, vehemently opposed to shaving under her arms, and saves the world from an invasion of blood-sucking badgers." What is thus created isn't a character. It's a walking agenda. You think you can get away with that? You can't. Just like the books of many writers in Soviet Russia reeked of communism, many books today reek of Political Correctness, with authors walking on eggshells lest they, God forbid, forget to pay homage to "diversity". My two cents? Write whatever you want. Put in whatever characters take your fancy. Men, women black, white, Asian, young, old, beautiful, ugly, super-powerful, crippled. Concentrate on your message, your voice and let it shine. Because there's only one you. You're unique. And that's the peak of diversity. Following last week's post on making time to write when there is no time, I would like to stress (though I know I've said this before), that even if you have little available time for writing, consistency is absolutely essential for those who want a jab at doing this professionally. Consistent daily output adds up, even though each separate day might not feel very productive. It's like chopping away at a great big rock with a hammer: you break off a tiny piece each time, and while for a long while it may seem as though you aren't doing anything at all, eventually the rock will crumble. What exactly do I mean? It's better to put in a 1,000 words a day, every day, than write 5K in a single exhausting burst and then need a week's worth recovery time. If you outline carefully and know exactly what you want to write next, those 1,000 words can be written very quickly - in 30-45 minutes. Most people can carve out 30 minutes of their day to do whatever... I mean, most people do carve out a lot more than 30 minutes, without even being aware of it, to do stuff like hang out on social media or watch cat videos on YouTube. A 1,000 words a day, 5 days a week, 20 days a month, is 20,000 words a month. It's the first draft of a 100,000-word novel in 5 months. It's two solid books a year which, while not insanely productive, is a respectable output. I know, I know - the first draft needs to be edited, it needs to be proofread, it needs to be sent out to stand in the throng of queries if you trad-pub; and if you self-pub, you need to format, obtain cover design, publish and market. But still, those 1,000 words a day will get you in the right direction. So don't be sorry you can't put in 2K, 3K or whatever it is other people write daily. Listen, I don't know what challenges you might be facing in your life right now. Maybe you have a day job, kids, elderly parents, other commitments. Maybe you have a spouse who thinks their hour-long browse of AliExpress is legit recreation, but your hour writing is shameful neglect of family duties. Heck, I've had periods in my life (mostly during Mommy Boot Camp with newborns) when I was so desperate for some writing time that instead of taking a shower every day, I took a shower every other day and wrote every other day. And I carved out epic novels. It was a slow, frustrating haul but it happened - one word at a time. Just do what you can, and do it consistently, and it will pay off. Warning: this is a long-suppressed rant. Speshul sensitive snowflakes are welcome to leave now, to avoid any harsh feelings. In the trad publishing vs. indie publishing debate, I keep hearing the following argument: "But trad pub produces plenty of crap too!" Let's say, for the sake of the argument, that you want to open a restaurant. You might decide to open a classy gourmet place where elegant waiters in tuxedos saunter around the candlelit hall, carrying silver trays, and live piano music can be enjoyed every weekend. Or you may say, "You know what? Not many people are willing to spend a monthly rent's worth on one dinner. I'd better open a hamburger bar." Hamburgers are legit. There’s a market for hamburgers. By choosing this option, you can feed people and make an honest buck a lot easier than by charging a gazillion dollars for half a dozen fresh oysters on crushed ice (or whatever. I'm Orthodox Jewish. What do I know about oysters?). You know what you can't do, though? You can't poison your clients. You can't say, "this meat fell on the floor and got trodden on, but I'll use it anyway." You can't use the same black rancid oil for French fries, over and over, for a month. You can't stick unwashed vegetables in salads and hope that salmonella will miss the target. You can't serve food on half-washed dishes and unwiped tables. You must, in short, adhere to certain Ministry of Health hygiene standards, or your business will be closed pretty fast, with a nasty biting fine thrown in. Trad publishing is that Ministry of Health. I am yet to encounter a single traditionally published book with missing commas, or a chapter title at the bottom of a page, or periods in the middle of a sentence. I have never seen a trad published book in which Mindy suddenly turns into Cindy on page 278, or which makes the reader want to puke and run away by phrases such as, "her eager and responsive body eagerly responded to his amorous advances". Indie books, though? I've seen all this and more, just this week. There is nobody to put their foot down and say, "this is illegal. We are closing this restaurant". You don't have to be the next Dostoyevsky. You can aim to be the next SciFi McHorror, or Nicholas Sparking Sparks, or whatever. But you can't serve shawarma made of a donkey with tuberculosis. Because if people come out of your fast food joint barfing and writhing with stomach pain, you'll soon go broke. So... I've said this. I'm quite prepared for an influx of voodoo dolls and Anthrax envelopes coming my way, but at least I got this off my chest.